Egyptian woman Eman Ahmed underwent a weight-loss surgery at Mumbai’s Saifee Hospital earlier this year. Eman Ahmed, the world’s heaviest woman who underwent a weight-loss surgery in Mumbai earlier this year, passed away in Abu Dhabi on Monday morning, just a week after celebrating her 37th birthday. Officials from the Burjeel Hospital in Abu Dhabi confirmed the news, adding that numerous co-morbid conditions including heart diseases and kidney dysfunction resulted in her death. “She had been under the supervision of a medical team of over 20 doctors from different specialities who were managing her medical condition from the time she arrived in the UAE. Our prayers and heartfelt condolences go out to her family,” said the hospital. Ahmed, a resident of Alexandria, Egypt, was brought to Mumbai’s Saifee Hospital for weight-loss treatment and transferred to Burjeel Hospital on May 4 after spending three months in Mumbai. 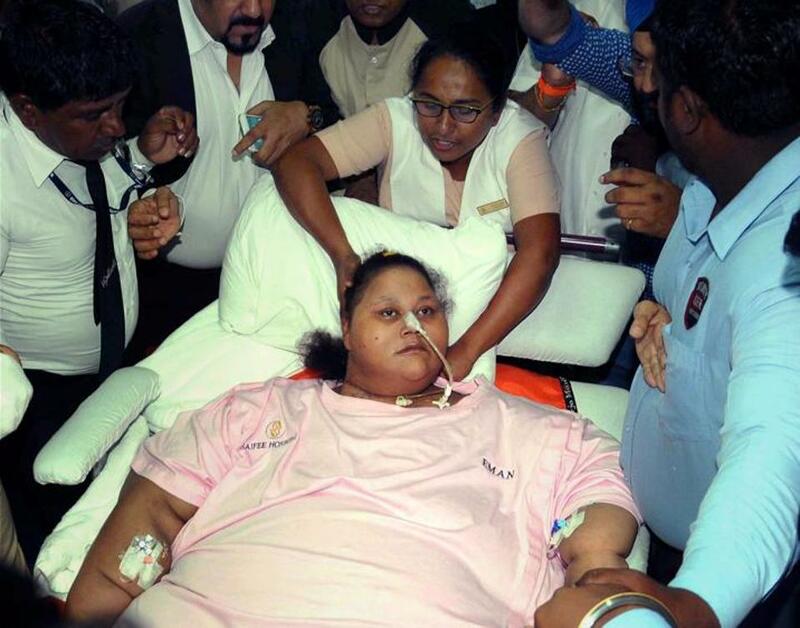 The 37-year-old weighed 504kg when she arrived in Mumbai on February 11 and considered the world’s heaviest woman. Doctors at Saifee said the bariatric surgery and diet regime they gave Ahmed helped her lose 300kg. Previously, doctors had shared videos of her recovery, claiming that she was healing three times faster than they had planned. Dr. Yassin El Shahat, chief medical officer of Abu Dhabi based Burjeel Hospital had said that by the end of stage two of her treatment, Eman will feed herself by mouth and use an electric wheel chair after achieving a reasonable weight loss by strict diet regimen.